In case you were worried about having to walk to capture anything in Pokémon Go, my phone’s been sitting at my desk since I downloaded the game this afternoon, and I’ve done alright. As much as I enjoyed wandering the streets of my neighborhood in the Pokémon Go beta, normally my workday movements are a lot more restricted. Generally I wake up around 8 AM, wander into my office, and stay there until around 8 PM, barring trips to the kitchen or the bathroom. Seeing as no one needs pictures of my bathroom, I left the phone at my desk today. That desk is located right about here. 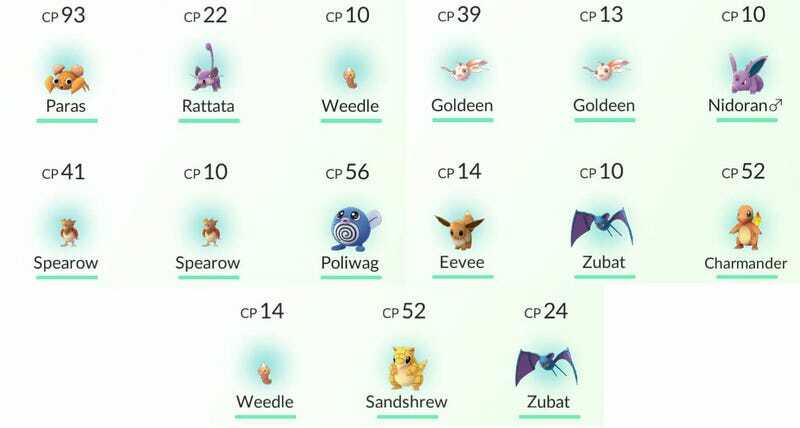 Not a bad haul, 15 Pokémon, especially considering the servers have been closed to our region for about five hours now. Of the lot, one was a starter (Charmander) and five were caught under the influence of the two Pokémon-luring incense items new players start out with, but the rest were just wandering about my area. So don’t worry, my sedentary friends. There are Pokémon Go critters in reach of your nest, as long as you are patient. I leave you with my favorites, Eevee I Didn’t Almost Get Killed In Traffic Capturing and Import Dreamcast.